The course can be purchased on DVD, as streaming content, or as downloadable content. If you purchase the streaming or downloadable formats, you will be able to download the Student Reader and Teacher Guide to your devices. We received the streaming version for this review. When you purchase your streaming content from Compass Classroom, you will log in to your account on the company’s website and click on “My Account” at the top. You will see a tab for “My Streamable Products” in the left sidebar. Click that to access all your streamable courses. Navigation is a breeze. On the course page, you can click on the drop-down menu just below the video to select the lesson. Click the tabs below that to download your Student Reader and Teacher Guide or check the outline of lessons. I loved being able to download the Student Reader and Teacher Guide to my Kindle Fire and to our computers. They download as a single zipped folder, so if you don’t want your student to have the Teacher Guide on their computer, you will want to delete that. My son said if felt it would be better if the Teacher Guide wasn’t accessible to the student, but I feel that shouldn’t be a real issue with high school aged students. The videos play fine on my Windows laptop and on my son’s Linux laptop. I was not able to get the streaming videos to work on my Kindle Fire, which is a minus for me. Most videos play fine on my Fire and having the portability would have been a plus. Each lesson has 5 videos, one for each day of the week, and they run about for about 25 minutes each. The format of the videos are Dave Raymond lecturing in front of a camera with periodic cuts of paintings, pictures, etc. to illustrate some of the things he is speaking about. Mr. Raymond wears a medium green dress shirt, sans tie, and stands in front of a tannish-greyish wall. Occasionally a title will appear across the bottom of the screen. It’s all very low-tech, but still looks professional. Video and sound quality are good and the videos have been carefully edited. Dave Raymond is a personable speaker who knows his stuff. He may be using notes, but he appears to be speaking extemporaneously. He speaks clearly, without fumbling or over-explaining, and he covers a lot of ground. He also injects some mild humor by referring to his own life and makes some references to popular culture. Mr. Raymond is clearly a Christian and makes no bones about approaching history from that worldview. At the same time, my son felt he was respectful in his treatment of non-Christian historical figures. Mr. Raymond begins by introducing the course and instructing your student in taking notes. This simple lesson was a game changer for my son, who had been trying to learn how to take effective notes his whole high school career (he’s an 11th grader), but for some reason couldn’t find a system that worked for him. Mr. Raymond’s note taking suggestions stuck, and my son has been applying them to all his studies with great success. I was impressed by the room for creativity in this course. My son is an artist and I can see him really getting into some of these projects. So, what do we think of ‘Dave Raymond's Modernity’ - World History Course? For the review period, my son did not use this as a full course. As I mentioned, we are in the middle of our school year and high schoolers generally can’t afford to abandon their coursework on a whim. Instead, he used the videos and readings as a supplement, choosing topics of special interest. He likes the course a lot and will probably go back to use it in full sometime when he’s not studying American History. He likes the use of primary source material and Mr. Raymond’s lecturing style. He did feel that one thing the course lacked was a textbook or further reading beyond the Student Reader. While he learned a lot from the lectures, he felt like there was something missing without a textbook. It would be possible to add your own textbook or additional readings if your student wanted more. 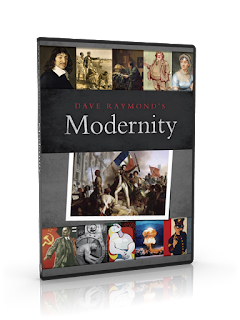 Overall, we think ‘Dave Raymond's Modernity’ - World History Course is a solid course and a great homeschool value. I highly recommend that you check out the FREE samples. Disclosure: I received a free copy of the product from Compass Classroom to facilitate my review. All opinions expressed here are my own or those of my family. I was not compensated in any other way. I am disclosing this in accordance with FTC regulations. We've used one of their courses and liked it, his humor makes it fun. I think my kids would enjoy this. I have Dave Raymond's American History and loved it. I've really wanted Modernity since it released! In fact, I saved the email reminding me of the sale, but I can't afford it right now since I won't need it for another 3 or 4 years, but I'd love to win it! We've been happy with other Compass Classroom courses, and I would love to try this one. this semester we have been running around to so many doctor and therapy appointments we have had to switch our course plans to mostly videos. I'm a huge fan of Comoass Classroom, I'd love to win this one to help add some credits to our semester! Thanks for the opportunity to try! This would be perfect for the missing piece in our history curriculum! We like Dave Raymond and video learning always has worked well in our home. I have a couple of other courses from Compass Classroom, and I find them really high quality. I was just perusing their site and looking at their history courses this afternoon! Would be so happy to win one rather than buy one - ha ha! I would love to try this program with my children I think it would be a good course to do with them. Oh, my. My history-loving son would adore this. We're doing modern history now, which is a great change of pace from all the medieval history he's done. I know he'd be thrilled. And I like something that doesn't require me to read. I would love to win it for my 2 highschool students to have a good solid history course for next year. We have used some of their other courses and my kids really enjoy learning from them! I love video driven history courses because we get to pause and discuss and learn together. Thank you very much for sharing a giveaway opportunity. It will be a good one help for my MBA assignment so I am going to take this one giveaway. We would love to win this! My son is working on CC's Economics and it is great!! We were looking at the American History curriculum and plan on using it. I am intrigued with Modernity as well. Like the combination of lectures, primary source documents and quarterly projects. My oldest starts HS next year and I would love to add this to our HS curriculum plan. Thanks for making available to those overseas!